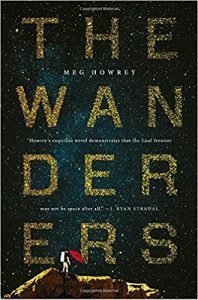 The Wanderers, by Meg Howrey, explores inner space in the framework of our journey to outer space. This book is a bit of a genre-busting anomaly. I wouldn’t call it sci-fi, but to someone who read more literary fiction, it might be too sci-fi. The book tells the story of three experienced astronauts asked to go on a simulated mission to Mars, in advance of the real thing, and of those they leave behind. We go along with them on a journey into the inner space of the heart and the psyche. I’m still trying to digest what I thought of this book as a reader, so I’m going to focus on why I think writers can learn from reading this book. The book shifts between the points of view of the different characters, who come from different countries, different backgrounds and cultures. Howrey does a phenomenal job, for the astronauts in particular, of writing from that different point of view (POV). I didn’t need the POV character to be named to know whose point of view she was coming from. Each astronaut has a very distinct internal monologue and way of interacting with the external. She used language and gesture and what was said versus unsaid to seat me in that POV character’s head. It’s set down a challenge for me to do better at that myself, since I do tend to write from multiple POVs. I like to think I am living vicariously through them, but perhaps I am also leaving too many imprints of myself along the way. As a story, the book raises questions about how prepared we can be to explore outer space when we still have so much to explore in ourselves. I liked the portrayal of the near future. It was optimistic yet realistic. I can’t help but think Prime Space is modeled on SpaceX, though I’m sure it’s just a coincidence…wink wink nudge nudge. If you’re interested in seeing how another writer deftly conveys distinct points-of-view, or in exploring the inner psyche and the future of space exploration, check out The Wanderers (Amazon).